My 4.5 year old son, who is fascinated by construction equipment, decided that this year he would like to be a backhoe. 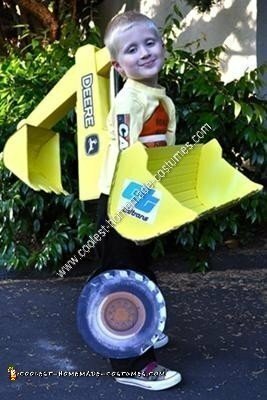 Knowing right off that there would be no store bought costume available, my husband and I set about devising how to construct a Homemade Backhoe Halloween Costume. First off we started sketching out our design — we used my son’s actual toy backhoe to make a template for the loader part, my husband drew free-hand the complete backhoe section after referencing several backhoe photos. Then we headed to the craft store for foam board (3 pieces white, 1 piece black), self stick Velcro tape (1 pack each black & white), yellow spray paint, yellow duct tape, and yellow fabric dye (for the t-shirt and Velcro tape). We already had white long sleeve t-shirt, iron-on t-shirt transfer paper, black pants, cardboard, wrapping paper roll and silver wrapping paper. I took photos of an actual backhoe and used them for the “Case” iron-on transfer sheets for the sleeves and the wheels. The wheels are photos from the printer glued on black foam board and attached to his legs with black Velcro strips which were hot glued to the foam board. The backhoe is attached to his body with two long strips of Velcro tape, one going through the belt loops on his pants and one running around his chest for extra stability. The loader is attached to him with duct tape loops around his arms and more loops used as handles. 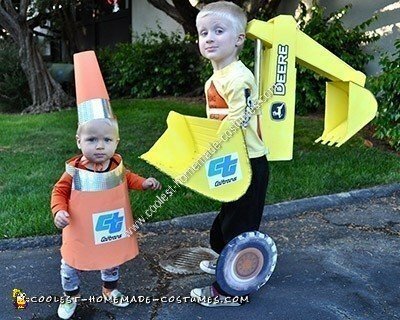 Lastly I printed out John Deere and CalTrans logos on the printer and glued them into place for a more authentic look and to match my younger son’s traffic cone costume. This is a great costume – extremely well engineered and produced. 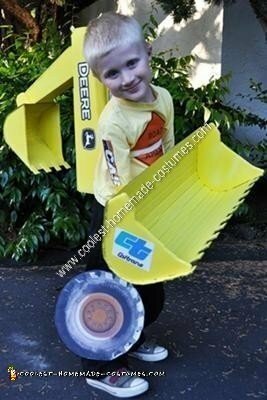 I’m sure that this costume was made for someone that LOVES construction equipment! He seems so proud of it. Excellent use of materials – must have taken hours!